Cathy Barton, Dave Para and members of the Gumbo Bottoms cast presented a shortened version of their Big Muddy musical for the Missouri Folklore Society’s Annual Conference on November 8 at the Isle of Capri in Boonville. The audience was thrilled with the experience and gave it a standing ovation. This 50-minute version of the show includes all the songs, narration and some of dialogue from the original show. Please contact us at info@gumbobottomsmusical.com or call us at 660-537-4139 if you would like booking information for school, conferences, libraries and parties. Not familiar with our musical? Set in 1928, Gumbo Bottoms is the story of Vivian Marks, a wealthy easterner, who discovers when her husband dies suddenly, that her family fortune has been depleted by his failed inventions. All she has left is a piece of bottomland in Missouri. “You mean 'Misery,'" Vivian sings in the opening song. Things go from bad to worse when she travels to Missouri only to discover her rich bottomland has been taken by the “Wiley Guiley Mighty Mo,” another of the 12 songs. “Gumbo” is the term used to describe the mud by the river. The story continues as big city wealth clashes with rural river life and basic survival crosses the racial divide. With song and dance, laughter and drama the 90 minute musical delivers a tribute to river life, rich, deep and heartfelt, pulled from stories of the region. We invite other theatres – professional, college, community and high school – to consider mounting their own production of Gumbo Bottoms. We’ve done the show with 6 characters and 4 band members, but there are many opportunities in the script for added townspeople and more musicians and we now have a CD of the songs available. 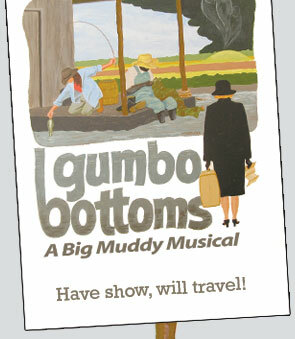 To discuss this further and request a script please contact Meredith Ludwig at info@gumbobottomsmusical.com.